Champion reinswoman Natalie Rasmussen has added another jewel to her crown with a first driving win in New Zealand Cup behind Thefixer. Under Rasmussen’s urgings, Thefixer determinedly wore down the tenacious Australian runner-up Tiger Tara in the last 100 metres of Tuesday’s $800,000 Addington feature. 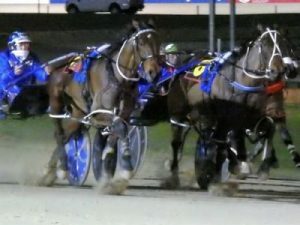 The maiden win in the sulky was Rasmussen’s fifth as a trainer after four previous victories with training partner, Mark Purdon. The horsewoman said adding a New Zealand cup title alongside her long list of achievements in harness racing completed her career. “This is the one I hadn’t won and this completes my career,” Rasmussen said. The win took Purdon to a total of six New Zealand Cup wins as a trainer and he is now tied for the all-time record with Cecil Devine and James Bryce. “It is just incredible, this is what you strive for,” Purdon said. Tuesday’s win was Purdon’s first without getting the upclose view of a winning driver. He was holding down fourth placing with Cruz Bromac, almost two lengths from the Thefixer. A month out from the two-mile feature, Thefixer’s cup preparation was left on shaky ground when he was unable to race after suffering a hoof abscess. His all-conquering trainers patched him back together and resurrected his campaign just in time for the five-year-old to win. Though he was fit enough to out muscle his rivals in a fast 3-53.9 winning time, Rasmussen admitted the horse could have stripped even fitter for the race. Her training and driver victory capped the second half of Rasmussen’s incredible career. She took a new path in 2011 when she left Queensland to move to Rolleston to work with Purdon. Then, she left the comforts of a glittering Australian career and her recently retired champion Blacks A Fake, Australasia’s richest ever pacer, behind. Though she has reached similar heights on both sides of the Tasman it is impossible to compare each of her experiences, Rasmussen said. The race for New Zealand Cup glory was down to three horses on the home turn when Australian raider Tiger Tara powered to the lead ahead of Thefixer’s stablemate, Dream About Me. Rasmussen had given Thefixer a perfect run in the trail when surrendering the lead to Dream About Me and driver Tim Williams early in the race. Though her horse had the best run in the race, the horsewoman admitted the pressure Tiger Tara applied to his rivals had Thefixer flat out before the turn. She credited her horse’s will to win for helping him overhaul the Australian in the shadows on the post. Tiger Tara was incredible in defeat after sitting parked for the last 2000 metres. His driver, Todd McCarthy, was full of admiration for the horse, but also disappointed. “It’s always hard when you only get beat that far in big races and you’ve had to breeze out and do a lot of the work. “It’s just one of those things, I think it came down the trip and where we lobbed and the fact Natalie had such a good trip there and was always going to have the last shot at us. Dream About Me fought hard to hold third and help Purdon and Rasmussen dominate the race’s top five placings. Her driver, Tim Williams, said she was just a little vulnerable after setting him a fast 3.53 race time. “It was a massive run. Obviously, you can be a little bit vulnerable when you set those sectionals and have those calibre of horses around you. “Full credit to them, they were too good for her on the day. “She kicked off the bend a little bit and Tiger Tara was off the bit like I was, but he’s such a war horse and is going to stay all day.